(INDIANAPOLIS, IN) -- First baseman Matt Skole launched his second home run of the season, but the Charlotte Knights dropped game one of their four-game series to the Indianapolis Indians by a score of 7-3 on Thursday night from Victory Field in Indianapolis, IN. 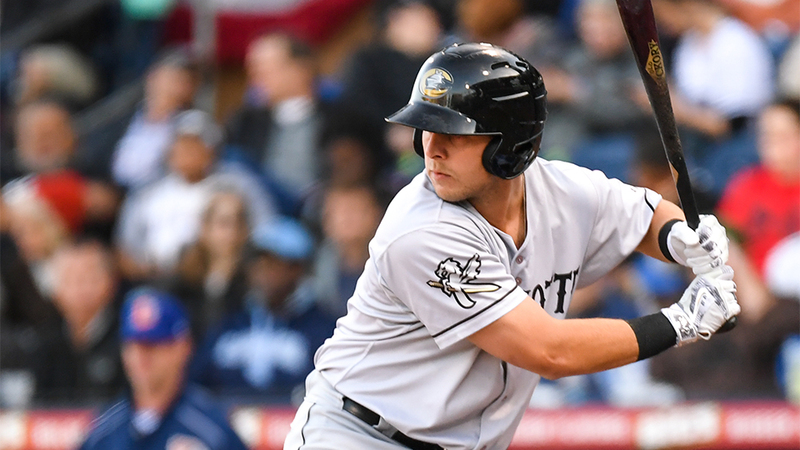 Fresh off of a three-game sweep of the Norfolk Tides on Wednesday night, the Knights hit the road on Thursday to open a season-long, 11-game road trip. The first place Knights, who entered the game with a 6-1 record on the season, recorded 11 hits in Thursday's affair. Despite the solid effort from their electric offense, the Knights were unable to slow down a hot Indians team. Indianapolis scored six of their seven runs of the game against LHP Jordan Guerrero (0-1, 10.13), who started for the Knights and was saddled with the loss. In all, Guerrero allowed six runs (five earned) on 10 hits over 4.1 innings pitched. Charlotte RHP Carson Fulmer was sharp in relief as he allowed just one hit over 2.2 scoreless innings. Down 4-1 after the first two innings, Skole pulled the Knights to within two runs with a solo home run off Indianapolis starter Mitch Keller in the third inning. He finished the game with two hits, while designated hitter D.J. Peterson (two hits) and third baseman Danny Mendick (three hits) also had multi-hit games. RHP Clay Holmes earned the win out of the Indianapolis bullpen after he tossed three shutout innings. The Knights will continue their four-game road series against the Indians (Triple-A affiliate of the Pittsburgh Pirates) on Friday night. Pre-game radio coverage of Friday's 7:15 p.m. game is set for 7:00 p.m. on 730 The Game ESPN Charlotte. The "Voice of the Charlotte Knights" Matt Swierad will have the call for all of the action. RHP Jordan Stephens is expected to get the start for the Knights.